Today, I’m bringing you a little help that saves me a lot of time and frustration when it comes to unzipping a lot of files. It’s a free program you can download called “Extract Now”. I LOVE it! You can unzip your files quickly, all at once, and then easily delete the zipped files to clear up your hard drive. It’s literally as easy as 1-2-3! After you’ve installed the program, open it, and then open another window with the location of your files. 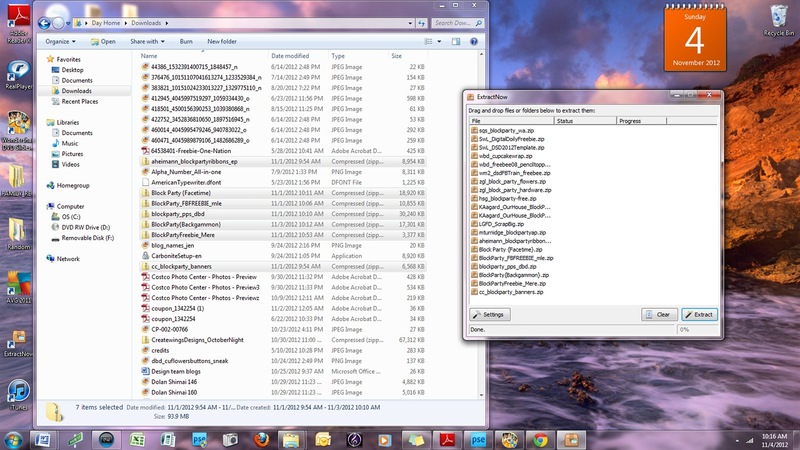 2-Open a window in your Windows explorer where all of you downloaded files are located. Then, open up Extract Now. Holding down the control key, select the zipped files you wanted opened and drag them over to the Extract Now window. Hit “extract”. It looks like this while it’s extracting. It works really fast! Look at all of those folders. It would have taken forever otherwise! 3-Press clear in the Extract Now window. You can now go in and delete your zipped files because they’ve all been opened. This is such a wonderful time saver. Now you’ll have more time to scrap and less stress trying to get things opened. Especially if you’re working under a deadline!